If you don’t know what I’m talking about, you should. You should go see the exhibit or at least know the work. Maybe I’m a cultural snob. Maybe I’m completely unoriginal, just another pseudo-bohemian claiming the usual cultural touchstones. But it was powerful to be in the same room as those photographs for the first time. They are as much a part of my cultural DNA as anything I have ever read or listened to. They are as much an influence on me as an artist as anything else. It was the country I recognized. 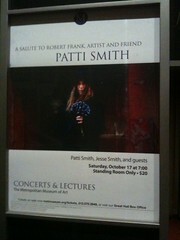 The event at the Met today – as Patti put it, “This year’s event” – was to celebrate that. It was songs and readings that tied back into “what it means to be American”. She relayed some stories about Robert Frank (who was supposed to have been there but was unable to be at the last minute). She read Walt Whitman and EB White and sang “Southern Cross” for Jim Carroll. She read Burroughs and Lenny sang Paul Simon’s “American Tune,” Patti sitting cross-legged on the stage watching him. She read Carl Sandburg and sang Sons of the Pioneers, read Emma Lazarus and sang Gogi Grant. Patti talked about what she remembered, what she thought she remembered, what she wanted to remember. The songs were supposed to be songs Robert and his family could have heard while driving around the country taking the photos that became The Americans. Jesse and her boyfriend (and at this point I should have his name, and I’m sure someone will come on here and chide me for not remembering it) provided instrumental accompaniment to the readings. Patti noted that the music was composed by the two of them. It provided a pleasant background. They finished with “Ghost Dance” and “People Have The Power,” and then Patti came back out, pulled out what I recognized in row O as the Pocket Poets volume of Howl (Patti noting that this particular book was usually kept in a box as she had it with her as she sat in vigil at Ginsburg’s bedside), and proceeded to read “Footnote to Howl,” which was, to me, the most astonishing part of the performance. Part of it was because it came at the end and the audience wasn’t interacting with it in any kind of traditional way, it caught them off guard, there was no polite, confused applause at the end of it. At first I thought it was an afterthought, but then realized that of course it was not, that it tied all of it together, all of the influences and backstory of the work. I have to go back, and see it again, and think about it harder. I first saw these photos when I was 17 and they still make me think. Patti noted that Robert still teaches her. I understand, I think, at least a little.